The Tempest was probably the last play that Shakespeare wrote alone. It is unlikely that he would contemplate it being performed 400 years later, and even more unlikely that he could imagine an adaptation that allowed it to be performed as single play in two venues: providing two completely different yet shared experiences of one story. 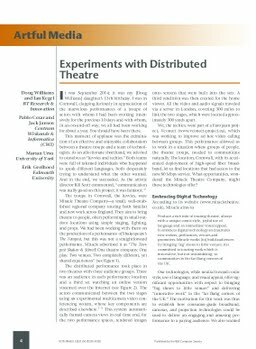 This achievement, enabling this distributed performance using consumer-grade technologies, was the result of a close collaboration between the Miracle Theatre Company and the EU co-funded Vconect project. It highlights the importance of close collaboration between artists and technologists in achieving significant progress in multimedia with mass appeal.